In recent months, there has been a call for groups from outside of Christ Episcopal Church to support the Church's outreach arm known as Red Door Jubilee Center. This includes the monthly Red Door Community Meal, which takes place on the last Sunday of each month. During the last Red Door Community Meal, that took place on Sunday March 31st, this call to action was answered with love and dedication from local favorite Burrito-Ville, which is located at 913 Broadway in Cape Girardeau. 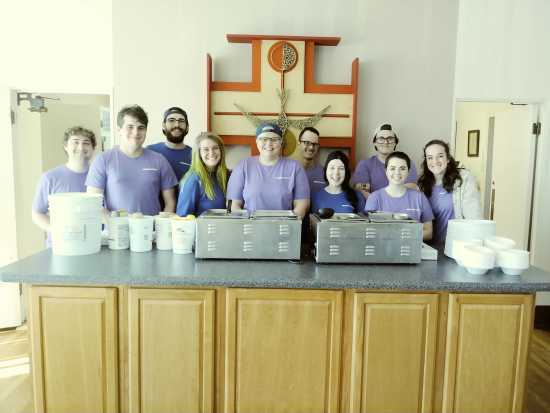 Ten staff members from Burrito-Ville took on the task of planning, preparing, and serving the meal; while Red Door's Administrator Amber Moyers worked with the group to provide communication items and day of support. Christ Episcopal Church aka Red Door Church hosted the meal and had church members in attendance to mix and mingle with meal goers further building the sense of community Red Door Jubilee Center seeks to grow. Amber Moyers stated, "Community partnerships are crucial to the sustainability of Red Door Jubilee Center as we work to help our community. Our work helps those in need in our community to meet basic needs as we do our part to grow a more just society. Burrito-Ville's work at the Red Door Community Meal is a shining example of how diverse community-centered groups can come together to support the people of Cape Girardeau." If you would like to help Red Door Jubilee Center in the work of supporting the Cape Girardeau community please email reddoorcape@gmail.com for more information. Donations for Red Door Jubilee Center's Hunger Ministry, which includes the Community Meal and Food Pantry, can be made via check to Christ Episcopal Church, 38 N. Fountain St., Cape Girardeau, MO 63701.